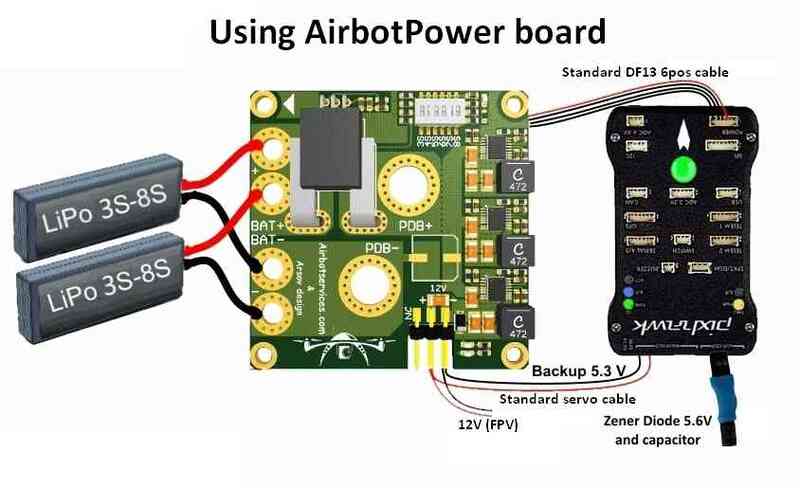 This page explains how to set up the AirbotPower Power Module and AirbotPDB stackable companion power distribution board. This power module is useful for higher power systems (battery voltage from 4S to 8S and currents from 90 amps to 150 amps). 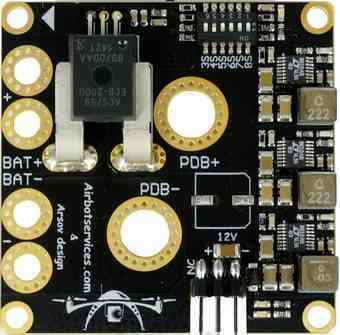 The board encapsulates all the wiring and complexity described in Powering the Pixhawk) in a single, simple package. 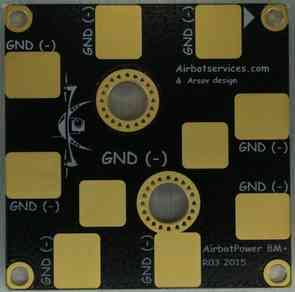 The AirbotPower Power Module (and AirbotPDB stackable companion power distribution board) provides a reliable and simple way to power a Pixhawk and other UAV components. 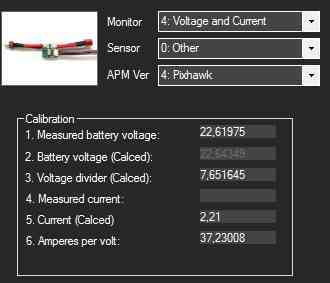 AirbotPower provides three power feeds: 2x 5.3V & 1x 12V (up to 3.5 amps each) and can supply main power to Pixhawk’s power port, backup power to the servo rail and power for an FPV system. It provides current and voltage measurements through the main power port, up to 150 amps and 8S. No messy wiring & no cable fiddling thanks to a 6-pin DF13 output connector to connect the board to Pixhawk’s 6-pin power port. Connecting the main power supply, backup power supply and servo rail “safety” connector, are shown below. Don’t use servos on the backup AUX 5.3V supply as they can supply just a few amps and too many servos might exceed this amperage. At least one of the DIP switch switches MUST be switched ON towards the ON mark (or towards the battery number marks); In the first batch of boards, DIP switches labels have been printed in reverse order: 3S, 4S,…,7S, 8S should instead be read reversely 8S, 7S? …4S, 3S. Later batches will have their labels printed in the correct order. On the bottom of the Power Board, there are some gold plated traces between the sensor and the 7mm holes and between BAT- and the PDB- . It is advised to add some solder on them for extreme currents. To do this you’ll need at least a 80W soldering iron and must use good solder with 2-2.5% non-corrosive flux. Higher power soldering iron leads to shorter heating time which is better for both the PCB itself and the components. The board also comes with a Zener Diode 5.6V (5W) + capacitor and easy instructions to assemble them into an extra safety module that plugs on Pixhawk’s servo rail. This is required on Pixhawk’s servo rail to trim any short voltage spikes (above 5.6V) that would be fed back to Pixhawk’s servo rail from external devices & servos (possibly causing Pixhawk to shut itself down). 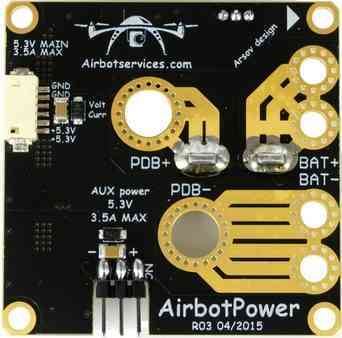 The AirbotPDB board (“10 solder pads” power distribution board) is stackable companion board (via XT150 connectors) that can optionally be used with AirbotPower. Power Module Configuration in Mission Planner explains how to configure a Power Module and get low battery alerts from Mission Planner. The output of the ACS758 current sensor produces a voltage of +0,6V (offset) +20mV/A (i.e. set copter parameter “BATT_AMP_OFFSET” to a value of 0.6).